Reduced jail time from an average 17 days to less than one in 36 surveyed patients who received medication-assisted treatment (Suboxone). In Minnesota, an innovative approach to improve population health is reducing the opioid crisis and saving taxpayers millions. In Morrison County, Minnesota, an innovative state approach to improving population health is also helping combat the opioid crisis and saving money. The Unity Accountable Community for Health (ACH) initiative has saved the state’s Medicaid program $3.8 million over three years by reducing claims for prescription opioid and related drugs. The accountable communities for health initiative, which takes a whole-person approach to prevention, offers a model for state policymakers seeking to develop sustainable, community-based prevention initiatives to combat opioid misuse and promote population health. Minnesota is one of several states developing accountable health models that emphasize community-based health promotion and cross-sector, cross-agency partnership to address health-related social needs, such as safe and healthy housing and access to wholesome food. Minnesota’s ACHs have the flexibility to implement projects to meet the clinical and social needs of targeted populations. ACHs in Minnesota are locally planned and governed by a leadership team comprised of local providers, community partners, and members of the population served. Each ACH in Minnesota received $370,000 in federal start-up funding through Minnesota’s SIM grant, and the Unity ACH and five others received additional SIM funding. One of the priorities of the additional funding was to support the ability of the accountable care organizations (ACOs) that partner with the ACHs to collect, analyze, and report utilization and quality data for the populations served by both the ACH and its partnering ACO. ACOs are the only entities with whom ACHs are required by the state to partner. This partnership also enables ACHs, such as the Unity ACH, to develop sustainability models and gain access to crucial health care information such as utilization and cost data. The Unity ACH includes local health care providers, pharmacies, insurers, local public health and social services agencies, and local law enforcement. The ACH’s lead agency, Catholic Health Initiatives’ St. Gabriel’s Health, uses a controlled substance care team that works closely with providers and patients to coordinate patient care and help patients safely manage their medications. The care team also identifies the health-related social needs of patients and connects them with services for housing, transportation, insurance, and mental health. The ACH launched medication-assisted treatment (MAT) in May of 2016 to treat heroin and opioid addiction, and expanded MAT into the Morrison County Jail. This initiative — the first of its kind in Minnesota — shows promising results in its first years of operation. 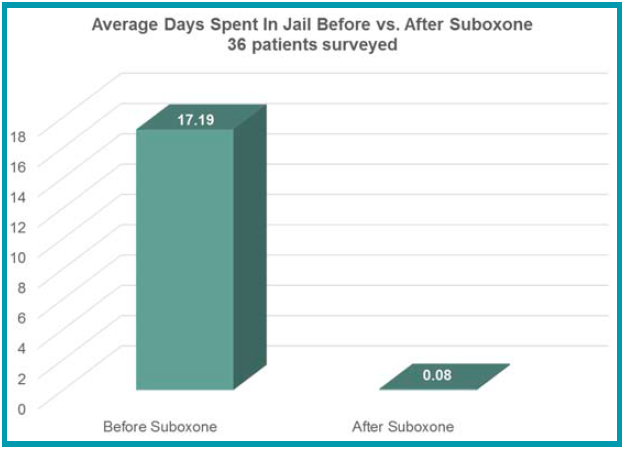 Before using MAT (Suboxone [buprenorphine plus naloxone]), 36 people surveyed reported serving an average 17 days in jail. After participating in MAT, participants reported spending less than one day in jail on average. This drop in incarceration for this high-risk population suggests the potential for significant cost savings to county jail systems. The Unity ACH reports saving Medicaid $3.8 million as of March 2018, due in part to providers prescribing 540,000 fewer doses of opioids, benzodiazepines, and stimulants, and safely reducing or stopping drug use in more than 450 patients. The ACH gauges savings by measuring reductions in the number of opioid prescriptions filled and tracking emergency department diagnoses for therapeutic drug monitoring. The percent of Medicaid beneficiaries with eight or more opioid claims declined in the area served by the program from 14.8 percent to 12.8 percent in one year’s time. Unity ACH has been able to calculate cost savings by leveraging data sharing with its ACO partner, which is contracted to serve Medicaid patients in Morrison County, and therefore has access to cost and utilization data for these patients. This cost savings gained the attention of Minnesota’s Congressional delegation. On Sept. 28, 2017, the ACH briefed Senate and Congressional staff about its rural solution to the opioid epidemic. The ACH team had earlier briefed Congressional staff in 2016. The Unity ACH model has also led to local policy changes. Providers are now standardizing their screening processes and increasingly accessing the Minnesota Prescription Monitoring Program database, an information-sharing system that helps providers track patients’ prescriptions to inform their own prescribing practices. The ACH team won the American Hospital Association’s 2017 NOVA award for its commitment to community collaboration in an innovative solution addressing the opioid crisis. They also won the Rural Health Team Award at the 2016 Minnesota Rural Health Conference. In 2017, the Minnesota General Assembly appropriated $1 million for accountable community opioid abuse prevention projects, which will allow eight other communities to replicate the Unity ACH model. The ACH’s reach will also grow through the Project ECHO (Extension for Community Healthcare Outcomes) Hub program, supported by the US Substance Abuse and Mental Health Services Administration’s State Targeted Response to the Opioid Crisis. The grants will support weekly eLearning sessions for providers about opioid care and case management. More broadly, the Unity ACH, in partnership with the state, is considering how savings might be reinvested to support health-related social needs such as transitional housing and healthy food. By incorporating a focus on the opioid crisis and community health within its health care delivery reform, Minnesota provides a model for other states seeking to build community capacity to improve health and lower costs. Support for this work was provided by the Robert Wood Johnson Foundation. The views expressed here do not necessarily reflect those of the foundation. Thank you to the Minnesota state officials and ACH leaders who informed this update, and thanks to Felicia Heider for collaborating on an earlier version. All errors or omissions are the author’s.